Just a 5-minute walk from Hanover’s Herrenhausen Gardens and city centre, this privately run hotel is also only 25 minutes from the trade fair and conference centre by public transport. 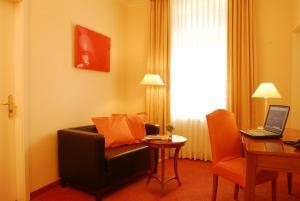 The 4-star Hotel Savoy Hannover prides itself on having an English flair. The rooms have an understated elegance. They are spacious, furnished in warm colours and feature modern amenities including complimentary wireless internet access. Wake up in the morning to the Savoy’s delicious comprehensive breakfast buffet, which is included in room price. Relax in the hotel bar, where food and drinks are served all day long. Unwind in the stylish sauna, or work out in the fitness room. The Georgengarten, part of the beautiful Herrenhausen Gardens, is just around the corner and ideal for jogging. The Savoy also offers bikes to take out and explore the city on.